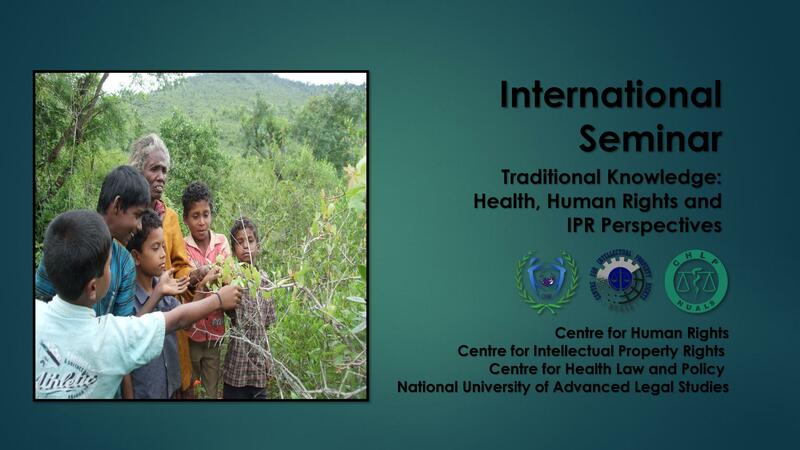 Following its success in 2015, the CHLP, CIPR and CHR under the aegis of NUALS is holding its annual International Seminar with the central theme as Traditional Knowledge in 2016. This theme is based on the discourse of health, human rights and intellectual property on traditional knowledge, which has evolved through numerous years of regular experimentation on a day to day basis of available resources by communities. Numerous studies have pointed to the increasing significance of such knowledge systems as an integral component of sustainable development in India. The culture and knowledge systems of indigenous people and their institutions provide useful frameworks, ideas, guiding principles, procedures and practices that can serve as a foundation for effective endogenous development options for restoring social, economic and environmental resilience in many parts of the country. However, today discourses of modernity, science and development at times reject these traditional practices because they lie outside the contemporary paradigms of modern science. The context of the increasingly visible impacts of IPR on the realization of human rights such as the right to health particularly in the context of Art 15(1) of the Covenant on Economic, Social and Cultural Rights, provides a relevant framework for addressing the place of knowledge and intellectual development in a human right context. Human rights, heath and intellectual property protection are distinct areas of law and have largely evolved separately over time. Nevertheless, a number of links between these domains can be identified. In the context of the introduction and strengthening of the intellectual property rights standards by the Agreement of TRIPS such rights raises a number of concerns with regard to their impacts on the realisation of human rights in general and the right to heath in particular. Current legal systems in India are inadequate, allowing for bio-piracy and the exploitation of our immense biodiversity and traditional knowledge. Preserving and safeguarding TK has assumed great significance in the recent past and a variety of initiatives are being made across the globe towards achieving the need to protect the traditional knowledge. It is high time we explore the availability, acquisition, scope, management and enforcement of rights and interests relating to TK and adopt those strategies to develop a legal framework for India. This conference aims to explore the present framework regarding traditional knowledge and to highlight the possibilities of synergies and exchanges between traditional knowledge, human rights and health from an interdisciplinary perspective. This venture will discuss strategies for generating social, educational, intellectual, and economic opportunities by building relationships that engage, understand, and accommodate differences in the various rights on traditional knowledge, in the related domains of health, human rights and intellectual property rights. The organisers of the Seminar call upon the legal fraternity, academicians from law and other social science disciplines, research scholars, social activists, representatives of governmental and non-governmental organisations and students of relevant disciplines and other stakeholders to present their well-researched papers at the seminar.